From the Home screen, tap the Messages icon. If this is the first time you’re using iMessage, on the screen that appears (see the figure), tap the New Message button to begin a conversation. 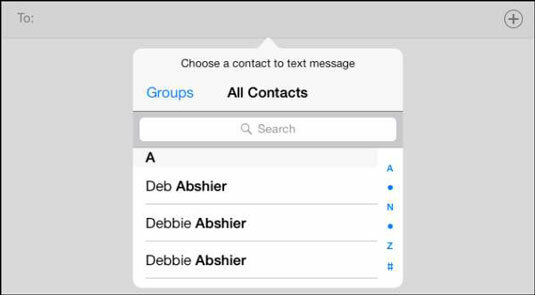 Begin to type an address in the To field, or tap the iPad’s Dictation key (not present on the iPad 2) on the onscreen keyboard and speak the address, and a list of matching contacts appears. Tap the plus icon to the right of the address field, and the All Contacts list displays, as shown in this figure. You can also use Siri (not present in iPad 2 or third-generation iPad) to send a message by simply pressing and holding the Home button and speaking your command and then selecting the correct contact and method of messaging (phone or e-mail). Tap a contact on the list you chose to display in Step 3. If the contact has both an e-mail address and phone number stored, the Info dialog appears, allowing you to tap one or the other, which addresses the message. To create a message, simply tap in the message field near the bottom of the screen and type or dictate your message. To send the message, tap the Send button. When your recipient(s) responds, you see the conversation displayed on the right side of the screen, as shown in this figure. Tap in the message field again to respond to the last comment. If you want to include another photo or video with your message, tap the Camera button to the left of the message field. Tap Take Photo or Video, or Choose Existing, and then tap Use to attach a photo/video. When you send your message, the photo or video will go along with your text. Talking with multiple people: You can address a message to more than one person by simply choosing more recipients in Step 4 in the preceding list. Canceling a message: If you begin a conversation and change your mind before sending your message, tap the Cancel button near the top-right of the screen. 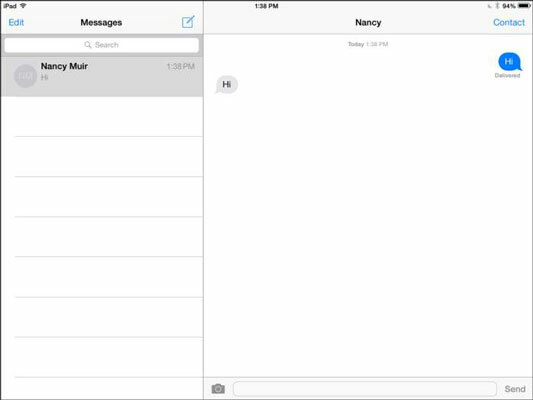 Viewing a conversation: Your conversations are listed in the left pane of the Messages app. Tap one, and the various comments in it display, along with a note of the date and time of each comment.